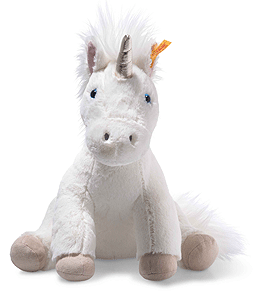 Floppy Unica Unicorn is hand made in the finest white cuddly soft plush with the famous trademark, stainless steel Steiff button in ear. 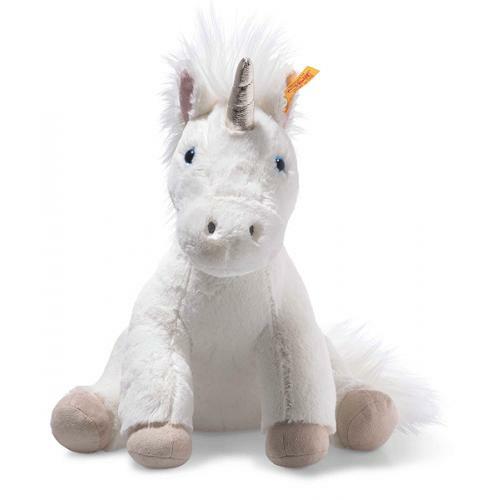 Soft Cuddly Friends Floppy Unica unicorn is 35 cm tall and has bean bags in her hindquarters and in her beige-coloured hooves for ideal stability when sitting. She is made of soft and cuddly, white plush fabric and has three elaborately embroidered stars on the right side of her hindquarters in a shiny beige. The eyes are blue, the nostrils are embroidered in grey and the inner ears are pink. Longer plush fabric is used for the white mane and tail. A fancy gift idea for little princesses and princes.